I was so excited this week at seeing how excited my students were about reading. I try my very best to give students the chance to read books that interest them. I only read about 3 novels a year as a whole class and the other novels they get to choose themselves. The biggest challenge for me is getting students to start finding books that they enjoy. So how do I foster a love of reading? My bell work for both my language arts and social studies class is for my students to simply read. It is easy for me and they always know what to do. They come in my room, get their cereal box (which is what they store their interactive notes and novels in,) and then start reading. They then have 10 minutes to read. Anytime they finish something early, they know to read. Having these expectations in place makes it easy for me to see who does not have a book that is just right for them. Those that are looking around the room during independent reading time, usually need some one on one assistant finding a good book. My students love getting new flyers from Scholastic. I talk up the books in those flyers like they are the best things ever. I just got an order in this week and the excitement on my students face to see the book box come is priceless. We ordered enough this time where I was able to give every student a free book coupon. Every student that ordered also got a stretchy bracelet from Scholastic. With all the points I have saved up I was able to buy several new books for my classroom library, which leads me to the next point…. I don't keep the same books in my book bins all year. I have a rack for new books that students always want to look at first when selecting a book to read. I buy books from Scholastic, Goodwill and Salvation Army so that I'm constantly able to give my students new choices. My students are each required to give a book talk. I have them stand at the front of the room with the book they want to recommend. They give a short summary, make a connection to it, tell what kind of person would enjoy the book and then read a favorite part from the book. I've already had students taking the suggestions of their fellow peers. If I didn't have the books in my library then they have even gotten excited enough to go out and purchase them. I talk to my students about what I read. It may be an article from the newspaper that I share with them. I want them to see that reading isn't just for school, it's for fun and something they should be excited about all throughout their lives. I have a sign on my door that tells my students what book I'm currently reading. It isn't rare to find a student with the same book I'm reading after I change my sign. Last year I had a reading log that students had to fill out every night to show how many pages they read. Then they had to do a short assignment like make a connection or give a sentence about the main character. I found that this just made students not want to read because it was a chore to them. If students were interested enough in their books, then they would want to read outside of school. If they weren't then they would just fake the reading log. My best way of making sure students read at home is to assign projects to go along with their independent reading, such as book talks or novel in a bag. 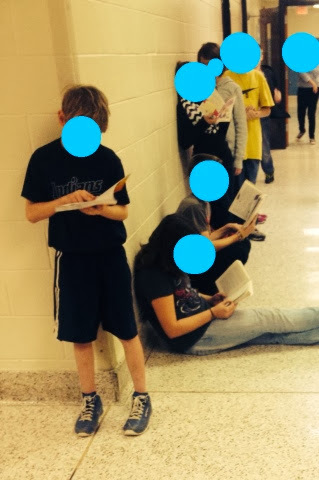 Here some of my students are reading their books while waiting in line outside the bathroom. I have permission to post their pictures online, but I decided to dot out their faces in this so no one knows which were the ones that did or didn't want to bring their books. I bet next time we go to the bathroom even more students will read while waiting in line. The power of peer pressure can be a good thing! How do you motivate students to read?